Happy Friday! It’s another Floral Friday today, I hope that you will love what we are sharing today. It’s always fun to gather with friends, and every Floral Friday, we do just that – virtually, at least! Shirley, Pam and Mary and I gather together and share a floral arrangement we created that we hope will bring beauty to your day and joy to your heart. And hopefully inspire you to go out and get some flowers for your own home. It’s cold and rainy here in Southern California. Once in awhile the sun peeks around the clouds, but to say that spring is in full swing would be a fib. I’m keeping my fingers crossed that by the time Easter comes and we host our annual Easter Lunch, spring will be here, the sun will be out, and the garden will have something blooming to hide the eggs under! So let’s get started with today’s floral arrangement. We decided each one of us would make something flowery and springy in a basket for this Friday. This week, we just happened to receive some beautiful antique French baskets at the shop, and I decided to create something gorgeous to show you in one of the baskets, the smallest one. These baskets were used over 100 years ago to take on train trips, larger than a purse, but not quite as large as a bag for clothing. Day trips only, perhaps, or to carry a luncheon packet and other necessities inside the train, while the porter stored the lady’s small valise somewhere in luggage storage? I had the best intentions of going out to look for beautiful, fresh new flowers. Let’s just say my day was filled with non-flower seeking activities, so by the time I did go to two stores to shop for flowers, the selection was not fabulous. At all. I left the last store with just a bar of Belgian chocolate, because #chocolatemakeseverythingbetter. So I had to get creative. Really creative, and in a hurry! Confession #1. This arrangement has 1. Left-over flowers. 2. Clipped greenery from our front garden. 3. Faux flowers. 4. And thankfully, yes! – real roses. I used some left-over larkspur, three ranunculus flowers and wax flowers from last week’s bouquet here at home that still had some beauty and life in them. And clipped some greens from the front garden, as well as a purple cabbage. I put all the “fresh” flowers and gleaned greenery from the garden in the container filled with water inside the basket. And then tucked in some of the purple faux hydrangeas that I just unboxed. Confession #2. I am somewhat of a perfectionist, but I learned something wonderful from this Floral Friday arrangement. It’s this: If you can’t have the perfect flowers you really want, you can still create something lovely that will make you smile each time you see it! Here’s what this arrangement can teach all of us. 1. THINK OUTSIDE THE VASE. Like all of us did today, you can use anything to hold a bunch of flowers. ANYTHING! If you use a basket, you need to place a glass container inside, of course, to hold the water. But the sky is the limit for things you can use to hold flowers. 2. FORGET THE RULES. It’s great to know what the rules are, but once you do, just go ahead and break them. It’s too hard to always be thinking of scale, size, complimentary colors and all that. Take risks, experiment, and trust yourself to create a stunning arrangement. If you love it, it’s perfect! 3. ADD THE UNEXPECTED. It’s fun to add vegetables such as cabbage, artichokes or fruit to your arrangement. A basket arrangement is actually wonderful for adding vegetables and fruits, since baskets tend to be a little more stable than a vase and are able to hold the weight of fruit or vegetables. 3. SUBSTITUTE. No flowers to be had locally that you love? Just cheat nature like I did by adding some faux flowers to your arrangement. No one will know! And if you have a great bush or tree growing in your garden, clip away. Greens from the garden are always my favorite “filler” in my bouquets. There. That’s it. You are ready to go out and clip a few greens, add a few flowers, arrange in a container of some kind, and stand back to enjoy your floral creation. Thank you for joining us this Floral Friday. I hope you create a beautiful floral arrangement for yourself and enjoy its beauty soon! Basket Love Lidy…oh so handsome and all the more beautiful with their patina and history! Don’t you wish you could see into their past at who carried them and what they toted? I love that you created your basket arrangement using a mix of real and faux…I would have never known if you hadn’t told me and hurray for anniversary flowers! Spring has been late to arrive here. February started out with a band and 70 and 80 days and then March arrived bringing 20 degree temps and blustery winds. Thank you for floral inspiration this morning. It’s always a pleasure blog hopping with you. Mary, that is exactly what I love about antique baskets. Often they are no longer perfect, but “perfectly imperfect”, and that is so charming. It’s always a pleasure to blog with you too, friend. Lidy, your basket arrangement looks just beautiful! Sometimes, the most unexpected plans give us the prettiest results. I am swooning over that gorgeous basket. Enjoy your day!!! Lidy, I love your gorgeous antique basket filled with beauty. The faux looks so real, I would not have known if you hadn’t said so. Using what you had available created such a stunning arrangement. I can’t wait for my garden to come to life so I can clip flowers and bring into the house. We have had three nights of freezing temps this week, so my patio peach trees that were blooming suffered severely. I love sharing Floral Friday’s with you! I love sharing Floral Fridays with you, too! Our garden isn’t that happy either, although we are getting our much needed rain. We’ve already had summer temps in early January, and now back to our normal California winter. So some of my little darlings budded out thinking Spring was here, and now they are hanging on by a thread in the cold. Hoping. Happy weekend, Pam! You’re floral basket looks absolutely amazing! I love everything about it! I just love that you used what you had on hand to make a unique presentation. And that Mr, FGH knows how to pick beautiful roses! Thanks so much Ginger! Thank goodness my Mr. FGH bought the roses, otherwise I would have truly been in a pickle. Your efforts did not go unnoticed or wasted, Lidy. That’s a beautiful arrangement. Sometimes I pass on flowers just simply because it takes more time that I care to admit to arranging them ‘just so’. Lidy, Your antique basket is the piéce de résistance! I enjoyed the history of these type baskets. Your tips on creating arrangements were helpful and encouraging. Your arrangement using clippings and cabbage from your garden mixed with anniversary flowers with a touch of faux blossoms has personality and charm. 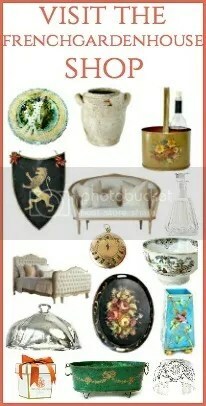 Great mix of real and faux Lidy! Also fresh flower can really make a faux arrangement look real and I think the fading flowers do too, it looks fantastic to me! Thanks so much, Jenna! Once in a while, it’s good to mix in the faux with the real. Hope you have a beautiful weekend! Bravo Lidy for taking those breathtaking faux flowers and mixing them with the special anniversary roses….and that basket….truly the other star of the arrangement! I think I would have lost time too in admiring the beautiful faux florals…You truly thought “out of the basket” on this stunning arrangement. Thanks again for always giving us “stories” behind the pretties you present to us. Truly an elegant arrangement using your extensive creativity! … Floral Fridays make Fridays even better! Happy Friday and have a wonderful weekend…hopefully it will be drier! Thank you Shirley! I had to give myself a firm talking to so as not to have a pity-party when the beautiful spring flowers were all sold out when I went to look for some. Sometimes it’s good to work with you have, and be happy with it! It’s such an honor to join the three of you for Floral Fridays. Wishing you a gorgeous weekend, friend. Thank you Maristella. I hope you have a lovely weekend! Your gift of arranging demonstrates the French flair for je ne sais quoi, and your authentic French baskets add that special something for which the French are known. Truly delightful post with beautiful French style and French baskets. Love your “melting pot” . It is really beautiful how you mixed everything. Think out of the vase eh? Lidy, A beautiful arrangement in a gorgeous basket. One that will add charm to any room, one that will make you happy when you see it. Happy Saint Patrick’s Day and weekend! Oh, so pretty! LOVE the antique basket! Lovely use of real and faux, Lidy. Great advice, too. Thank you Bobbi. A little hard for “perfectionist” me but it still had joy and beauty!